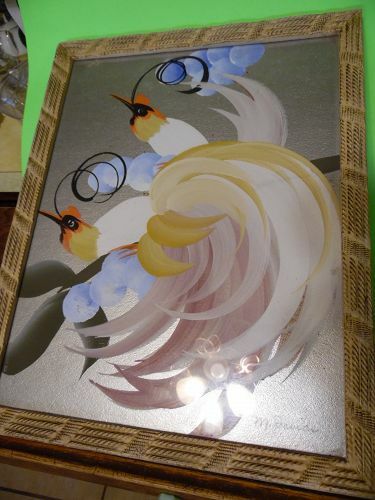 Done in a wonderful art deco style, an original painting of 2 Phoenix birds or birds of paradise with a metallic silver background. The frame is original and is bamboo style measuring 19 1/2" tall, x almost 16" wide, condition is excellent. 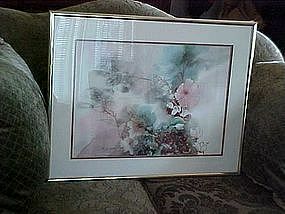 Signed "M Davids", original frame, with glass. 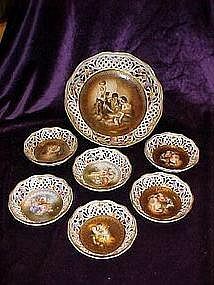 Collectible plate by Ridgeways Royal Vistas Ware, From Paintings by Famous Artists. This is of "In The Gulf Of Venice" by famous artist William Clarkson Stanfield 1848. 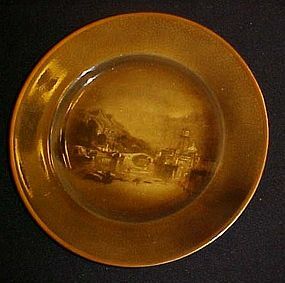 THis plate measures just over 8" in diameter and has no damages, and has gold trim. Makers intentional crazing effect under glaze on the front and back to give it that old appearance. All of these I have seen have this treatment. 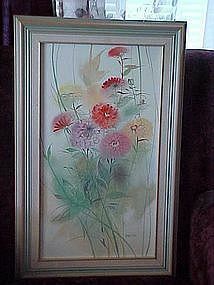 A very lovely original dye on silk painting by margaret Hodgson titled "Gentle Harmony". Framed and measures 22" x 28" overall. Signed in the lower right. Wonderful perfect condition. Zinnias, by well know California artist Harriet Ross. 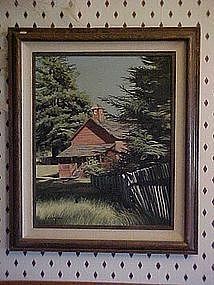 This pretty framed oil on masonite painting measures 11" x 20". Signed & label from Ruth Carlson Gallery, Mendicino CA. Beautiful condition. 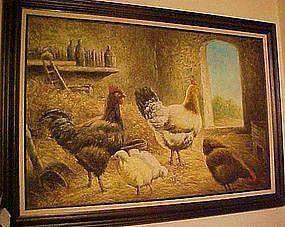 This oil painting on canvas measures 20" x 16" and is framed. 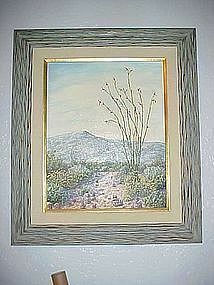 Painted by artist Mildred Ford who is famous for her desert art scapes paintings of Arizona and surrounding areas. Well know for her oil paintings with their pallette knife texture and the colors. She retired in 1981. This one is titled "Sedona Desert- Another fine Day" and is signed in the lower left. Beautiful oil. This must be professionally crated and shipped. Nice oil painting by California artist Carol Hutchinson. Painted from the Saratoga area, oil on canvas. Red School House, Signed in the lower left corner C. Hutchinson. Framed, and measures 20" x 16". Excellent condition. Must be professionally crated to be shipped. 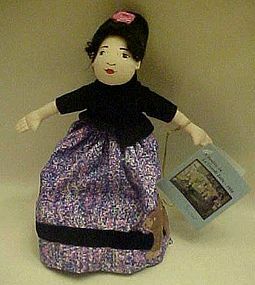 Issued by The Curator Collection in the Masterpieces of Impressionism series. 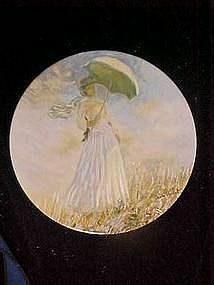 This is "Woman with a Parasol" by artist Claude Monet. Hand numbered and was limited to 17,500 pieces. This plate is a low number of 839. Plate measures 8 1/2" in diameter and comes in the box with its certificate of authenticity.Pristine condition. 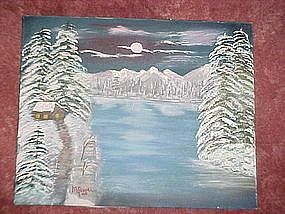 Nice oil painting by M. Ponder of a winters lake and mountain scenery at night. Dated 1990. Nice condition, ready for your favorite frame. Canvas measures 16 x 20. Darker colors than appears in the photo. Photo does not do justice. Hand painted and signed by M.Ponder '90. 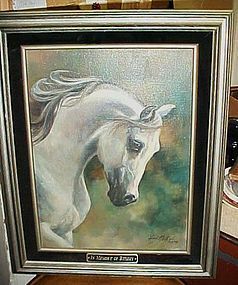 A lovely canvas oil painting ready for your special frame. 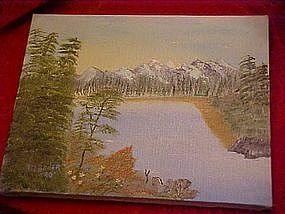 A Scene of the mountains and the lake. Measures 11 x 14. Excellent condition. 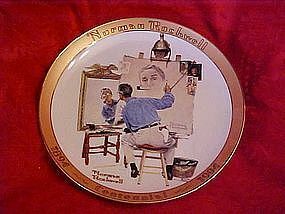 First limited edition plate in the Norman Rockwell Commemorative stamps collection series. Triple self portrait, by the Bradford exchange. Comes in perfect condition, in the original box with certificate of authenticity. Measures 8" in diameter, lots of nice gold trim edgeing. 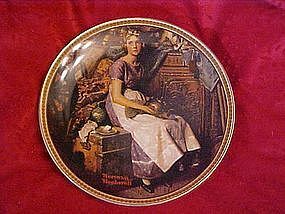 Knowles china presents Norman Rockwell's "Dreaming in the attic" from Rockwell's Rediscovered Women series. Plate is perfect, measures 8 1/2", and comes with original box and certificate of authenticity.1981, limited edition , nice gold border.